The Mountain Athlete Compression Sock is built to provide comfort and support for high-mileage outings. With progressive compression built in to the lower leg, these socks will promote blood flow and keep your muscles in place while decreasing soreness. Taking into consideration that this is a technical purpose sock, the fit and feel are incredibly comfortable and high quality. This is a compression sock so as I read some reviews I have to remind myself and others that the reason it is tighter fitting, is because the purpose it serves during hiking. That being said, these socks are designed perfectly. They build things to work at First Lite, and here's a leading example. The core of your hunt lies in the base layers between you and your gear. These fill the void that use to hold me back in the past. These socks are comfortable around the feet, but seemed very tight around the calf. Good sock but did not work for me while hiking. Very tight fitting sock, little tough to get on but I'm ok with that because I feel like the compression really helps with keeping my feet warm. That being said they do not stay on the calf as well as the Mountain Athlete Triad sock. If I had a choice between the two I'd choose the Mountain. Overall a great sock though, would buy again. I had a DVT awhile back so compression socks are a must for me. This sock is great as far as compression goes and it's pretty warm. My only complaint is it runs a little small. Having just two sizes is part of the problem. I'm a size 11, and I wish it was bigger. This my first (and only) piece of first lite wear that i have been disappointed in--and i purchase a lot of first lite stuff! I have worn compression socks in the past-but these were so tight i could barely get them on-and i have a skinny foot and ankle/lower leg. I tried wearing them once, but they made me too uncomfortable to wear- so i gave them away. Great socks that actually stay up on the calf! I wore mine for 4 days in the Backcountry and they never came down. Used in the mountains of Colorado for archery. Fit good, stayed warm and kept my feet dry. Wear a size 10 shoe and a L fit great. I just got back from a 6 day archer Elk hunt in CO. Although the weather was warm during the day these socks performed great!! We hiked between 5 - 15 miles a day, and these socks kept my feet very happy! No blisters or over sweating all week!! Very comfortable. They stay up when hiking, and dry fast. I'll be ordering more. They're a little snug, but I think with the word compression in the name it's to be expected. The best socks I've ever worn. They are comfortable and keep your feet dry and warm without the bulk and sweatiness that usually comes with it. My feet sweat a lot and these socks keep my feet dry and warm the whole morning. They fit very well, but they were taller than I expected. almost to the knee. It would be ideal for not wearing any base layer if you wanted a layer under your pants, but don't want to be too hot. I have put 25 miles on one pair and they have done great. From 90 degrees to 32 degrees active hikes they dry fast and offer great support and no blister issues. If you have a semi big calf size up! Mine fit my foot amazing but my calves were super tight. I put them around a Nalgene to stretch out the calves part. Great sock washes easy and holds up well. If calves are muscular or bigger from taco bell I would size up. Great tight fitting sock with good padding under foot. The body of the sock is thin to keep it breathable and cool. Goes up high on the calf. I make my money on my feet as a infantryman, I have tried every sock out there. This is the best I've ever worn. Did 43 miles and 11,400ft of elevation change over 6 days while elk hunting and never even thought about my feet. Amazing product. I have several socks from all brands over the years. I was surprised at the comfort! The materials used in this sock are top notch, drys quick! Even though it’s a compression sock over time I didn’t notice them pulling at my leg hair, like most other socks you start feeling your hair being pulled. I'm a big fan of these socks. I use them for tree stand and spot/stalk whitetail hunting in Michigan, annual elk trips in the Rockies, and as a frequent international business traveler (10+ hour flights). For hunting, they pull up over my calves and don't fall down, but aren't too tight either. My calves are somewhat muscular build. I've never developed hot spots or blisters on my feet while hiking in them either. And I like the idea of having more insulation on my legs if needed when the weather turns colder. I've found the added bonus with these socks working as a great compression sock for international travel with long flights. My feet don't swell nearly as much and they're plenty comfortable too. Fit is all-around ideal. I'm 6'2", 195lbs, size12 boot, and ordered the L/XL size socks. Ordering a new pair (got mine a bit too close to the fire), but these are great hiking socks and they really take care of your feet. these things are warm and compress great. Keeps my feet from getting sore when on a deep walk in the woods. 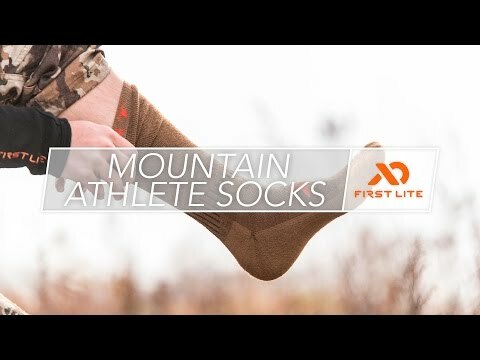 First Lite nailed these socks. I was skeptical at first but the first mountain trip temps ranged from 40-83 degrees and my feet were never an issue. This was the first trip out in the cold where my feet did not get cold. I could really tell the difference with increased blood flow in my legs. After long days walking my legs did not ache at all. Wore these on a 3 mile multiple day backpack trip and they performed flawlessly. Only socks I’ve ever worn that didn’t sag and fall down throughout the day. I wore these for an 11 day high country Muley hunt. My feet stayed warm and dry even during the 20 degree mornings. I put over 20 mi on these during the first weekend of archery elk hunting in Oregon, and these performed better than I could have expected. I had absolutely no raw spots from seams, blisters or discomfort from these at all. My feet stayed warm during cool mornings and not overly warm during the heat of day. I would recommend these to anyone. These fit very snug...as they should. Day after these arrived I went on a long, weighted training hike and absolutely loved the feel of these in my boots. Glad I finally upgraded from basic wool socks. Excited to use these out in the field this September! A little tight in the calf - I understand it's a compression sock but a bit tight. I wear a size 13 shoe. Bought these socks for pheasant hunting and am very happy with them. I've used them breaking in my boots and they've been incredibly comfortable. Can't wait to try them out in the field. This is as big as they make so I will have to look elsewhere for the perfect sock. These socks are a game changer after a long hike little to no swelling would definitely recommend these to people that swell for sure. Snug and tight hugs my calves perfectly not to tight with the perfect amount of arch support. Good quality and as the name suggests it’s a compression sock so it runs a bit tight. I've used compression socks before but these are just to tight on my calf, I think it has something to do with the length because the sock ends at the thickest part of my calf. These compression socks are great for all day sits in the tree stand. I love to use them on cold days when I'm sitting all day to help keep the fresh WARM blood pumping down to the feet. By far the best socks I've ever owned! Reduced hot spots on my feet on long hikes and I never find myself having to pull them up like other socks. Also they don't make my feet sweat like other wool socks. I purchased 2 pair of these , they are best after a couple week break in period . The collar of the sock is now comfortably conformed to my leg but they feel great , I’ve hiked a lot in them , my feet run warm and for hiking and hunting these are now my go to. My wife nabbed them and I was pretty upset . As far as quality goes they are superb. Comfortable , holding up great to washing and so far so good . I would recommend these for any outdoor activity regardless of temperature plus offeres the health benefits of distal leg compression. 2 thumbs and 2 toes up . I have slightly larger calves and these things stay up! They dry quickly and are super comfortable. These are by far my favorite socks! They stay up all day even after many miles when hunting and have never experienced a blister. They have no odor what so ever and I sweat!!!!! You cant go wrong with these bad boys!!!! I wear a size 13 and they fit. They are a little snug but work great. These are my go to socks for high mileage hunting, waterfowl, and skiing. They seem to really excel while skiing and surprisingly waterfowl hunting. For skiing due to the added support everywhere below the knee and waterfowl because I have always had problems with cold weather socks slipping down my heal as I walk in waders. These fit like a glove and kept me warmer all the way up to the knee. I own about four pairs of these cause I can’t handle wearing anything else during a hunt. That being said, they are extremely resistant to odor and you could probably wear them for a week before the stench killed you. Warm, comfortable, and breathable. Another top of the line merino product from First Lite. I wore these on a backpacking trip last weekend with shorts on (got some weird looks but I didn’t care, they are that good). I just completed a 50 mile endurance race while wearing the Mountain Athlete Endurance Sock. My socks and shoes were wet for 30+ miles and NOT one blister. A must have in every kit. They fit, feel, function of these socks is off the chart. Only knock would be that with my tiny calves they tended to creep down after hiking for an extended amount of time. So a wider elastic section at the top to keep them in position would be a benefit to me. Due to poor circulation I have been battling the discomfort of cold feet while out hunting. It seems like every sock I tried would only take the edge off at best. Long glassing sessions were a challenge as staying on the move would be the only thing that helped. A friend suggested I try compression socks, amazingly enough first lite is one of the very few (maybe only?) hunting clothing manufacturers who offer real compression socks, so I gave them a try. What a world of difference, due to better blood flow My feet stay warmer longer. My only complaint is the limited sizing. I wear size 14 EE boots and have a 19” calf, while the l/xl fit and do their job I feel like they are maxed out at my size. If you have tried every thickness of sock under the sun and still have cold feet, give these compression socks a shot. Only one outing on these socks so far. 11 total miles covered over roughly 18 hours. Spent the first 1/2 mile waist deep in a swamp and these socks moved the moisture away from my feet well enough that I didn’t have to change socks after walking them to a “dryish” state. Will buy another pair. As gross as it may seem (or the lady likes to tell me) I wanted to see how long I could wear the same pair of socks without washing them. After 10 days of only taking the socks off to shower there is NO odor to them at all. Not to mention these are the most comfortable socks I have ever put on my feet. I really like the calf compression is sock offers. I basically lived in them for a week at deer camp this fall and they held up great to odor and kept their shape nicely. I would recomemd these to any outdoorsman. I absolutely hate when my hunting socks fall down. These ones are very comfortable and they stayed up on my legs throughout the day. They have just the right amount of cushioning to protect your feet. Highly recommended! Great socks. Wore them working in hot summer with caulk boots, and for skiing. Will test them hunting shortly but they are holding up very well. This sock is perfect mix of merino wool with the right amount of compression. I put these on for the first time and went for an 8 mile hike with a heavy pack. These stood up stayed dry, did not smell at all. I am buying a few more pairs to take with me on my backpacking trips. Multiple days on a two animal hunt. Over six days two pairs sufficed. Another great product. Hiked through the Yellowstone back country with these then put them to test through 40+ miles chasing elk in MT. Use them for mid season use in all forms of boots from knee high rubbers, to running traps in hip waders and hunting ducks in waders with them never falling down. They are awesome. Buy 2 pair bc they stream/sink wash easy and you want to keep these on at all times bc they are just that awesome. I first purchased these socks for elk hunting in September. I came home and started wearing them everyday. I work construction and am on my feet all day. They wick away all the moisture from your feet and stay relatively scent free. Even during hot, early North Carolina deer season. I've now walked about 100 km of trail, logging road, and bushwacking with these socks on. Perhas I should be less so, but I am really surprised at the difference a quality pair of socks can make in the comfort of my feet. I've been wearing cheap merino socks from costco for the majority of my hikes but was always ending up with foot problems. I decided to try a higher quality sock and my feet are thanking me. No blisters since owning these socks, which was an occasional problem in the past. They're plenty warm without being too thick and the long length of the compression sock has yet to be irritating. Whether it's coincidence, better hydration, or the sock itself I haven't had any cal cramps since donning these socks either. These are now my go to pair! Never realized how important socks were until I got these bad boys. I have a pair of smart wool socks, and they don't come close to the comfort. These also offer a fair bit of warmth all the way up to my knee, and I really like the compression. I feel like it makes a big difference in terms of fatigue and comfort. Definitely getting another pair or three. Lightweight, yet warm enough for cool mornings and cool enough for warm days! Wicks enough moisture that you don't have to worry about reusing the same socks later in the day. Super comfortable, great socks! An athletic sock for many situations. You can wear these with the Dodson briefs for an excellent base layer on those chilly mornings. Great sock! Has the feel of an athletic sock for long hikes but the function of wool. I never see anything like it. This sock will be my go to for the early Nevada hunts. In addition to the Triad, these are the most comfortable socks I've ever put on my feet. 20+ miles a day and absolutely zero issues, hot spots, blisters, etc. I purchased a pair of these socks for a long distance endurance military competition (32Km ruck run with 40lbs rucksack, 4Km portage with canoe and rucksack, 8km paddle, and a final 6Km ruck run again with only the 40lbs rucksack) after training with them for a week with just the one sock I began using them as my liner sock, mostly because for the last 2 decades I have worn a sock system of a wool outer and a nylon/spandex liner. Once I switched back to this format with mountain athlete compression sock as the liner I could not have been happier. I ran the entire competition on dirt roads without hot spots or blisters. I always grab for these socks first! i wore these socks for a full week archery hunting and they live up to the standards as said in the areas of delivering sweat from your feet, no stink and they help with no blisters and the toe seam is comfortabel. Best socks I have ever worn. Comfortable and pulls water away from my feet. Nice feature with the wool is they don't stink like a normal sock will. I have worn them for up to 4 days in a row in the backcountry without them smelling terrible. Wore for 20 miles in the backcountry and never had any issues with hot spots, slipping, or blisters. I have been so impressed with this product. Definitely the top of my list of must have gear! Wore these socks several days camping and hiking in June and the socks never fell off my calf and never developed an odor. Well worth every penny! Sock seems to be well made and a large fits me great. I am a size 11 shoe and 12 boot. Sock really grips the back of your calf so it doesn't fall after a period of activity. I alternated two pair of these socks during a 40 hour outing through extremely rugged, vertical and wet terrain. The temps ranged from below freezing to mid-70's and while my feet were always wet from countless creek crossings and wet conditions, I never had any issues. No blisters, hot spots, or socks falling apart. And the compression actually compressed, which was huge in helping to keep my feet and legs comfortable. Love these socks!! These are amazing socks! I was advised by a physician to try compression socks to assist recovery from a lower leg injury, after being kicked by a mule while on a hunting trip. I have tried cotton compression socks, and never liked the cold, clammy, wet feel of them. These socks provide great compression, make my legs and feet feel great, keep my feet warm and dry, don't smell, and are easy to put on and take off! Buy them, you won't be disappointed! "Thank You" First Lite, for making an incredible product! As someone who is physically active, travels frequently and hunts hard, I appreciate an actual compression sock. These socks are exactly as described and amazingly hold compression for extended periods. I recently wore them on a 5 day range session and amazingly they maintained compression the entire week. These socks are great for everyday wear but even better for recovery. Athletes realize the importance of compression and these socks are a great item to have. They're comfortable enough for everyday wear but really do help when your legs and feet are exhausted. Highly recommended. These socks keep my feet warm and dry throughout my hunting season. I wore these socks from mid August through early November. They keep my feet comfortable through extreme heat and extreme cold. They dry extremely fast. I use compression socks for ultra marathon running. I am thrilled that someone finally brought this technology to the hunting world. These socks help fight fatigue on my back country hunts. These are hands down the most prized socks I own. They dry rapidly and cushion perfectly through the many terrains I hike into. These socks are great from everyday wear to hunting. The compression helps with fatigue and the merino makes it possible to wear them multiple days without odor. I pack two pairs on hunts, switching them out daily. Buy two pairs, you wont regret it! These are great socks. I wear them in my snake boots. They keep by feet comfortable all day and are nice and tall. Great socks for long days in the backcountry. These work good no matter the weather. Keeps my feet dry. One thing that has always been a downer....having comfortable and warm socks that do not fall down while you walk. By far the best hunting socks I have ever owned, and they are awesome for snowmobiling as well! Very comparable to Smart wool PHD hiking socks. I wear these in the early season with a poly liner sock and they perform well. Just about the perfect weight and thickness for early season and high activity mid season hunts. Stayed up on calves better than Smartwool PHDs and so far haven't pilled as badly as my smartwools. I will say I have a lot more use on my smartwools so time will tell. I LOVE THESE SOCKS...It is 108 degrees in AZ right now and I am breaking in my hunting boots with these socks. They hold my foot and calf secure and breathe very well. These will be my goto socks for the upcoming season: from August whitetail in the desert to Fall Muley in CO and Nov elk in NM....GREAT PRODUCT FIRST LITE. I didn't realize the importance of a good pair of socks until I purchased these compression socks. Absolutely a must in the back country. I like the length that goes nearly to my knee and the tight compression area that goes around my calves prevents me from getting sore on those long and steep climbs. Super comfortable. And the merino wool prevents any odor whatsoever. I will literally not leave for a hunt without these socks! Best fit and feel of any sock I have. 10 miles a day and the feet feel great. There is a small problem they are not made for guys with large muscular calves. They are also a tad short for me, Would have been 5 stars if they would go up a bit higher on my legs. Wore them all September in Colorado. I felt like my feet in general were more comfortable. Normally my feet just ache after a day of hiking.... but even on days where I put in 15+ miles of hiking my feet felt fine at night. Comfortable and warm. If you wear these you wont even know it becasue you wont be thinking about your feet at all. How often do you "notice" your feet unless something is going wrong. I've stayed warm and dry with these with no problems from winter into summer. If your feet stay dry and pain free = you're more comfortable. If you're more comfortable = you hunt longer. If you hunt longer = you get more stuff dead. If you get more stuff dead = you're not a bad hunter. Don't be a bad hunter, get yourself a pair (or 6) of these Mountain Athlete compression socks! Of all the hunting gear I own, these socks are in my top 5 must-haves. Can't recommend them enough. I have horrible, f'ed up feet. These compression socks really helped me so that I wasn't crying by the end of the day. And most amazing, they never stink, even after several days! Cheaper than my Smartwools, too.